Fraud by individual voters is both irrational and extremely rare. Most citizens who take the time to vote offer their legitimate signatures and sworn oaths with the gravitas that this hard-won civic right deserves. Even for the few who view voting merely as a means to an end, however, voter fraud is a singularly foolish way to attempt to win an election. Each act of voter fraud risks five years in prison and a $10,000 fine - but yields at most one incremental vote. The single vote is simply not worth the price. But Fox News regularly and deliberately does its best to make its audience think that there's some kind of epidemic of voter fraud breaking out. Seriously, imagine putting this story in your portfolio when looking for a job. That job would have to be at the National Enquirer or Star, where she could exchange the phrase “Dead Dog” with “Space Alien” and fit right in. Great reporting Megs. 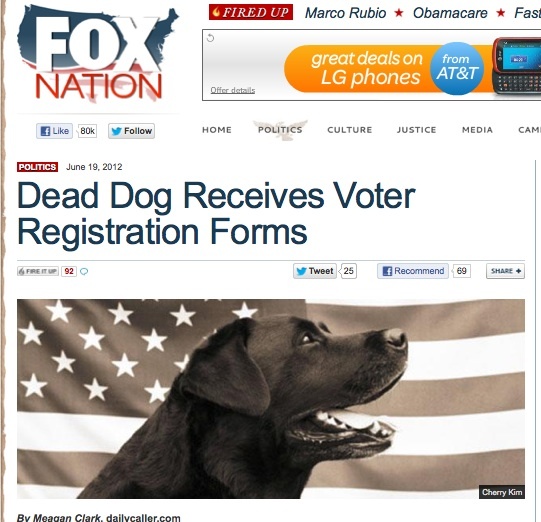 These must be the same dogs that Rush Limbaugh said would be covered under “Obamacare”. But they’re dead. So I guess that “Obamacare” didn’t work. But Fox News regularly and deliberately does its best to make its audience think that there’s some kind of epidemic of voter fraud breaking out. I’m still working on my maps that show which states have had voter fraud committed by major offices or state committees the last three elections, and I’m turning it up in droves from the right. From the left, I’m only turning up small amounts, and the perpetrator was committing it for a small office, like a town sheriff. It may not be an epidemic, but it’s certainly a problem. Too bad Fox News won’t say which side commits 99.9% of it.